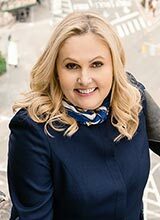 Highly regarded by her clients and colleagues alike, award-winning broker Anna Kahn has become a pillar of the Manhattan real estate community over the past 20 years. Anna's hard work and high level of professionalism has made her stand out amongst her peers, which has led her to be ranked within the top 1% of all agents in New York City. Her expertise of New York City real estate has made her a go-to person for journalists specializing in the field. She has been featured in The New York Times, The Wall Street Journal, The Real Deal, and The New York Post. When working with sellers, Anna markets properties to ensure the maximum level of exposure with the highest quality of presentation. She implements breakthrough technology including videos, time-lapsed views, virtual staging, 3D walkthroughs, and exquisite artful brochures with stunning photography. Anna pays close attention to detail and utilizes the finest photographers, floorplan drafters, and stagers in the industry to ensure that her clients' properties sell for the highest possible price. She is patient and makes the selling process pleasant and enjoyable. Buyers working with Anna receive the same outstanding service. Anna's extensive and in-depth knowledge of the Manhattan market enables her to find her clients the best properties for the best values. Anna's knowledge of buildings and expertise in navigating the co-op board process is unparalleled. She takes away the stress of buying a home by simplifying the process for clients and providing well-informed guidance. Having grown up in New York City and worked in the industry for over two decades, Anna helps clients make the best decision for them and their family. Anna deeply cares about her clients, offers the upmost professional service, is known for her tough negotiating skills, as well as her warmth and candor. "My compass has been honesty and hard work. On either side, buying or selling, it's a big move and, as a broker, one must be knowledgeable, highly ethical, patient, and empathetic." Anna is a life-long resident of the Upper West Side. She graduated from Columbia Preparatory School and the University of Vermont. She is intimately familiar with the NYC schools, having raised her two children in the City. Anna speaks Russian fluently. "Anna has helped us buy two apartments and sell one. She is professional, focused on her clients, navigates obstacles to the close with ease, and sticks with the deal until it's completed." - Ron L.
“Anna is the best! She is a highly skilled professional who is also a person of high integrity. Her low-pressure, patient approach allowed us both to sell our apartment at a great price and to take the time we needed to find a new apartment that was just right for us. Our only regret is that we won't see her as often now that we are happily settled!” – Jeanne R.
“Being new to the New York area, I was not very familiar with all the nuances and considerations of the real estate market. It was also extremely busy and stressful to move back to the US after a foreign assignment. I was so fortunate that Anna handled my real estate search. She was certainly informative and took the time to fully explain the process. Our family changed the parameters of our search a few times, and Anna was very patient as our needs evolved. I never felt rushed into any decisions. Anna was very thorough in preparing us for the coop board approvals so we could be successful." – Lesley M.
“Anna is simply the best professional I've ever met. She prepared the tour of the properties based on my expectations and organized everything perfectly - everything without ever meeting in person before. Honestly I didn't expect half of what she delivered. Anna made sure I had perfect idea of what properties were available, what was the market like and also literally forced me to overcome my laziness and see the properties that were all within the budget and requirements I had location wise. She helped me to decide as I don't know the city that well. In retrospect I couldn't be more happy with the decision. The process of purchasing and price negotiation couldn't be smoother and basically we had a deal within 48 hours. Anna continued to support the whole purchase process as I was already oversees and couldn't handle many of the necessary steps in person. After purchasing the apartment Anna found tenants for me and again did everything on my behalf. The only thing left for me was to sign the lease contract. Anna is taking care of the apartment ever since and there was not a single issue I would have to deal with. It's important to understand that while describing my experience with Anna I also compare her to other people in different cities in USA and Europe where I was also purchasing similar properties. I honestly wish I had Anna in every single city in which I had to deal with real estate transactions.” – Peter S.
“Anna was able to quickly put as at ease with what can be a bewildering sales process. She and her team put together a stellar marketing plan for us - which led to a sale more rapidly than we imagined. " – Jed W.
“Working with Anna to find our apartment was a pleasant experience. Anna showed a genuine interest in our needs, took time to get to know us and ensured that we saw only appropriate apartments. She impressed us with her knowledge of all parts of Manhattan. She is patient and didn't pressure us to make a decision until we were ready. When it came to board approval and closing she made the process as smooth as possible. “ – Nicole K.
“Her responsiveness is as impressive as her knowledge and skills. That's a quality I really appreciate. As well, her demeanor is spot on. Charming and warm as a default, caring and sympathetic when called for and tough and to the point when you need her to be. Anna knows her stuff. You'd be hard pressed to find anyone better than Anna Kahn, seriously.” - Al C.
Анна Кан,	член	Совета по	недвижимости	Нью-Йорка,	привнесла	в компанию	Halstead Property Companyсвой	большой	опыт	работы в	сфере	торговли,	маркетинга	и	международного	бизнеса, а	также свою	преданность	клиентам и	работе с	ними. Анна	работает в	Halstead с 1996 года,	является	членом	Совета по	вопросам	частной	брокерской	деятельности	компании Halstead	— это	престижное	звание,	которым	награждаются	профессионалы,	занимающиеся	продажей	многомиллионных	домов. Анна	также	является	членом	Совета	лучших	агентов по	операциям	с	недвижимостью	компании Halstead	— звание,	которого	удостаиваются	наиболее	успешные	риэлтеры	компании. Благодаря	умению	Анны	выслушивать	пожелания	своих	клиентов,	сейчас она	работает в	основном с	людьми,	которые	приходят к	ней по	рекомендации	ее	предыдущих	клиентов, а	это	является	верным	признаком	хорошего	брокера. Анна	открыта,	работоспособна,	заботится	о каждой	детали,	начиная с	первой	встречи с	клиентом и	заканчивая	последним	штрихом	сделки. Анна тесно	работает с	продавцами,	чтобы	настойчиво	и	обдуманно	продавать	их	недвижимость	по	максимально	возможной	цене. При	общении с	покупателями	Анна	пользуется	своим	знанием	постоянно	меняющейся	ситуации	на рынке,	чтобы	найти	лучший	вариант за	кратчайшее	время. Анна	родилась в	Санкт-Петербурге	(Россия) и	свободно	говорит	по-русски. Живет в	Манхэттене	с 1978 года и	досконально,	со всех	сторон	знает	город. И	самое	главное —	она	действительно	любит свою	работу.